Although we both work in the city, we very rarely get to have lunch together. An endless merry go round of meetings, interstate jaunts, errands, crises and pre-rapture planning always seem to get in the way of a good old couple lunch. This week Marg put her foot down, and suggested a place that she’d been to a couple of weeks. 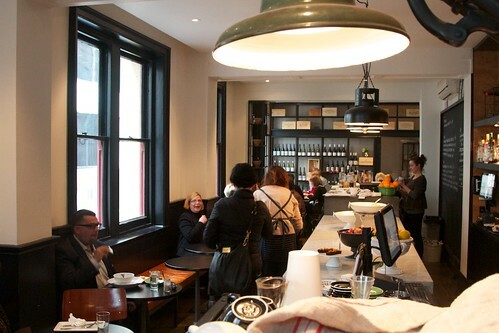 That place was Threefold on Flinders lane. Melbourne unfortunately didn’t share my enthusiasm for our lunch date, throwing down some of the worst weather this winter. Cold, wind and rain; the triple threat of awful weather. When I arrived, I found Marg huddling in the doorway of Threefold, waiting for a table. So we stood around, waiting, and about ten minutes later, another couple came in looking for a table. One of the waitresses, came up, gave them a menu, and then a couple of minutes later went to seat them at a recently vacated table. The front-of-house guy quickly intervened and gave us the table first. The waitress was genuinely apologetic, and quickly scrambled up some menus and water. Well played, Threefold. Well played indeed. The only other hiccup of the lunch was that they had run out of mini-burger buns for the sliders, and had to serve them on baguette. More of an aesthetic complaint, because the baguette was delicious. 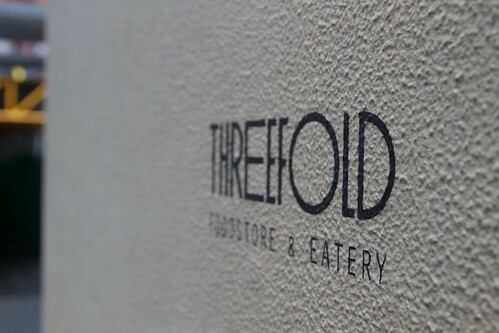 Threefold was a great lunch, and would be perfect venue for any city-bound date. Tick tick tick. Walking into Threefold for lunch on a hideously cold and rainy day was like wakling into a big warm hug, but better, because this is the kind of metaphoric hug that includes a big bench of delicious looking food. 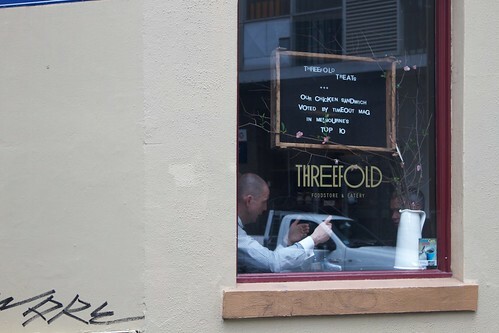 I’ve been to Threefold once before and thought it was a great place for a proper lunch in the city, the kind of lunch where you sit down and talk to someone for a solid hour (or more) and eat something a little bit more special than the sushi roll from downstairs or sandwich from across the street. The menu offers a selection including pasta, salads, sandwiches, soups, pies and tarts. The menu changes frequently so there’s plenty of variety to support return visits. The food is also delicious which is a big plus, indeed the chicken sandwich was recently named one of Melbourne’s top 10 sandwiches by Time Out (along with the likes of Earl Canteen and Beatrix). As I mentioned above one of my favourite things about Threefold is that it is the sort of place where you can actually sit down and have a proper break at a nice indoor table (which you can also book ahead of time). The atmosphere, particularly in the weather we’ve been having lately, is friendly, cozy and a little bit hectic. Just what I want from lunch in the city. 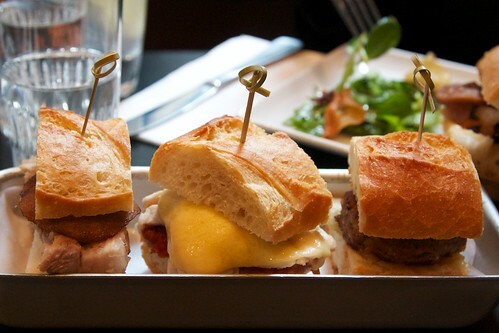 Gerard had the El Tauro triple treat sliders (mini burgers): Pork & Apple, Chicken & Smoked Mozarella, Lamb & Feta ($15.50). He loved the concept but was a little disappointed when he heard they’d run out of mini burger buns. Luckily the disappointment vanished when the eating began. He thought the pork & apple and lamb & feta sliders were amazing. He wanted a bit more from the chicken though (maybe in part because of the chicken sandwich fame). In the end these little would be burgers left him with a smile from ear to ear though. 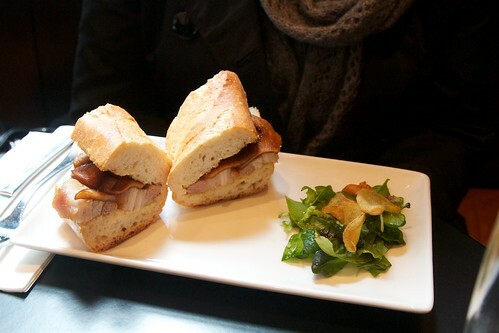 I had the roast pork belly and caramelised apple sandwich ($12). It was pretty great, I was intending to try the chicken this time but I couldn’t go past caramelised apple, and I’m glad I didn’t because it was the highlight of my day. Last time I visited I had the corned beef sandwich with sauerkraut, mustard & jarlsberg ($12.50), I don’t have a photo of it but I thought it deserved a mention because it was also a big morale booster. Great food and the sort of atmosphere that makes you want to stay all afternoon.